Photos of the CompuBox statistics that show how many punches Manny Pacquiao and Timothy Bradley have thrown, landed and missed during their world welterweight bout on June 9, 2012 have circulated in the internet. 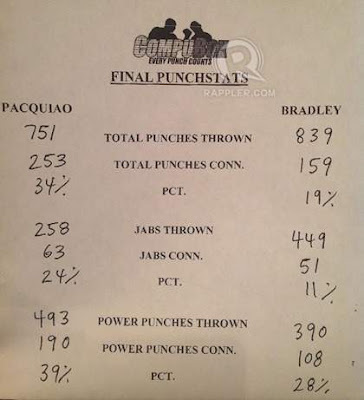 CompuBox is a computerized punches scoring system run by two operators. Each of them watches one of the two fighters and has access to four keys, corresponding to jab connect, jab miss, power punch connect, and power punch miss. The operators key in the different punches as they happen, collecting punch counts and hit percentages along the way. The Pacquiao vs Bradley fight ended in a split decision, with two judges scoring it 115-113 in favor of the American boxer. 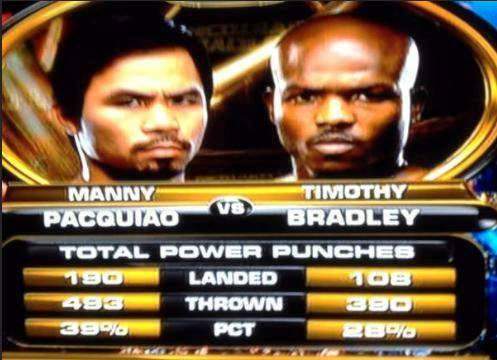 Many boxing enthusiasts and analysts were shocked and have cast their doubt on the result of the bout, saying Pacquiao is the real winner and Bradley doesn’t deserve the belt. If only the CompuBox stats were official, Pacquiao could have retained his title, but, as others would say, the Filipino boxing icon should have knocked out Bradley so the score cards won’t be needed.